Transform this formerly utilitarian space into a comfortable, stylish, and eminently livable part of your home. Plus, don't forget to enter the RAM CAVE contest for your chance to win $25,000 towards the ultimate man cave. In many homes, the garage is nothing more than a place to park the car, store the Christmas decorations and hang up a few rakes. However, with a little ingenuity (and these quick tips), a garage can be transformed into an awesome space that’s as comfortable as—and a lot more fun than—all the other rooms in the house. 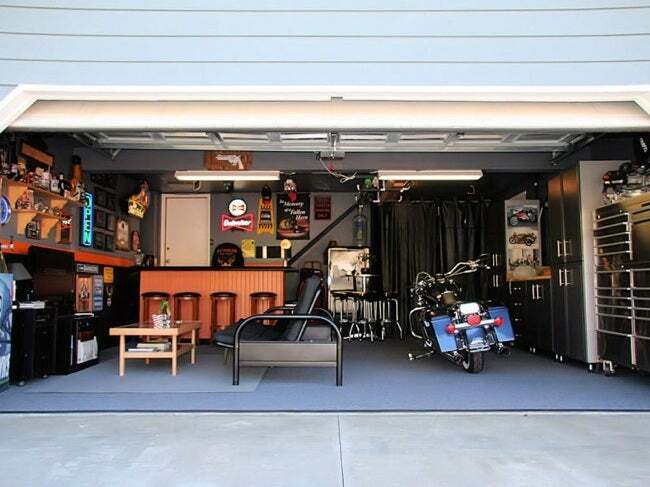 To create a livable garage space, your first step should be to create zones: one for your car, one for your workshop (if it’s located in the garage), and one for kicking back and enjoying a space of your own. In each zone, use smart storage to hide tools and other “garage items” away. Metallic tool chests can create an industrial feel for the space, while wooden cabinets can be stained for a more upscale look, or painted to keep things casual and visually interesting. Your different zones can work fine in an open plan concept; once you get the areas organized, they’ll naturally stand apart from each other. For a more formal division of space, get creative with partitions. You can build a unique screen by hinging together a collection of mismatched vintage doors, create an industrial look by using chain-link or other metallic fencing, or suspend corrugated steel panels from chains connected to the ceiling. After you’ve created a space for your car, maximized storage and zoned off your work or play space, it’s time to make it your own. 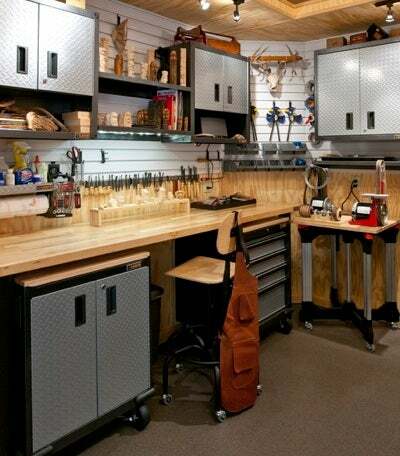 If the primary use of your new man cave will be as a workshop or for use as a hobby area, make sure to create a work bench that’s large enough to get your jobs done. Install adequate lighting, run enough outlets to handle your power tools, and consider on-wall open storage to make your tools visible but neat. A shop vac or wall-mounted vacuum system provides quick and easy clean up after projects are done. If the new space will be primarily for relaxing, use as much imagination as you would for a room inside the house but try to stick to a theme like upscale sports, sci-fi, vintage automotive, hunting lodge, gentleman’s lounge or modern minimalism. Consider putting in a leather sofa, comfy chairs, a coffee table that reflects your style and, of course, a big flat-screen TV mounted on the wall. An area rug goes a long way in holding a space together and saves you money by not necessarily having to redo the floor. It can also help hide cords from table lamps, which will warm the space up and make it feel less like a garage and more like a real room. Other accouterments (i.e. toys) you might want to put in your new “garagement” could include a video game system, beer fridge, bar, dart board or—for a really big space—a basketball hoop or golf simulator. If your garage is uninsulated, you might want to take care of that to keep the space warm in the winter and cool in the summer. Most uninsulated garages have exposed beams so you can roll your insulation in easily and cover it up with sheetrock. If the space is already finished but uninsulated, you could use an installer like Retrofoam who can spray the insulation behind the walls. For warming the garage in the cold months, a simple space heater might do the trick if the square footage isn’t too big. Otherwise, a hanging gas-powered forced-hot-air unit is your best bet. In the summer, you can get airconditioned comfort by installing an individual unit in the wall or a window or by using a free-standing evaporative cooling unit. Let’s face it, when you’re in your man cave you’re going to want to go on the Internet to check global affairs, research philosophical conundrums and maybe do some, er, extracurricular surfing. Hopefully your home’s WiFi signal is already strong enough to reach out to the garage. If not, you can install a signal booster like this one from NetGear. Chances are, your garage already has a water line running through it for a hose bib. If so, it’s easy to splice off it to create a utility or bar sink. Even if you can only get a cold water line, that should be fine for rinsing beer mugs or martini glasses. If you want hot water without having to run the lines from the hot water heater, you can install an on-demand “tankless” unit under the sink. If your garage floor is in decent shape, you can probably get away with simply painting it. Give it a good power washing beforehand and fill any cracks with a mortar repair compound. Next check to see if the floor needs to be etched so that the paint will stick by dripping some water on it. If the water gets absorbed, there’s no need to etch, but if it beads on the surface, then you’ll need to treat the floor with an etching product first. After etching, let the floor dry overnight, then prime, paint with a floor-grade epoxy paint. Follow with a second coat if needed. If the floor seems too far gone for a paint job, consider using gym-style rubber floor tiles. They hide a lot of sins, are comfortable to walk on, insulate for sound and make cleaning up spills a breeze—whether they be beer or motor oil! This post is sponsored by Ram Trucks. Its facts and opinions are those of BobVila.com.